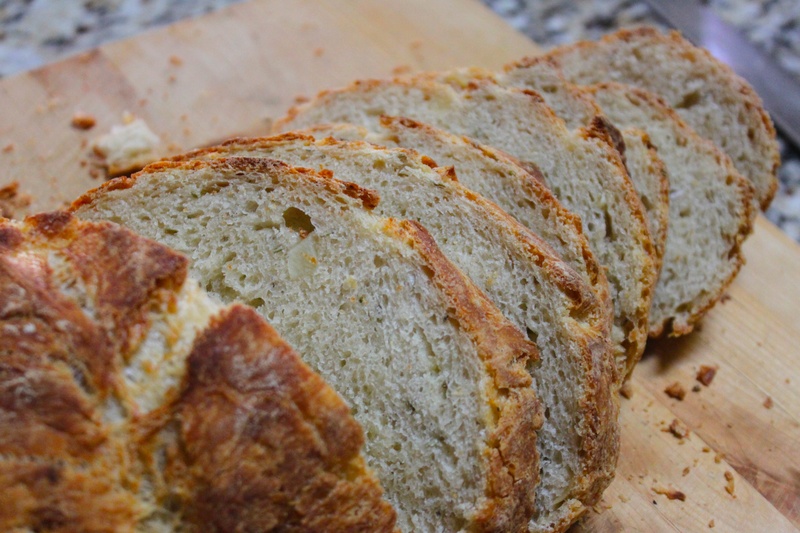 Rustic bread is one of my favorites and until recently I didn’t think it was going to be easy or even possible to make in my own kitchen. Thankfully, when The Stocked Freezer recently hosted Chef Victor Rede, he presented us with this flavorful rustic loaf recipe. Did I mention you don’t even knead this dough? This recipe is so easy, all you need is a little patience and you will have one praise worthy loaf of bread to share with your family and friends. By using the dutch oven your bread will create a golden brown, crunchy exterior while creating a moist and flavorful center. You can also try this basic recipe with your favorite additional ingredients, be creative and enjoy! Using a 1 gallon Ziploc freezer bag, mix all dry ingredients together. Once all dry ingredients are mixed, add your choice of various additional items, in this case, roasted garlic and rosemary. Mix additional ingredients well and then add one tablespoon extra virgin olive oil. Next pour in your 1 1/2 cups, or 12 ounces, of the liquid you choose to use, in this case beer and close Ziploc bag, letting out all extra air. Taking the Ziploc in your hands smash the bag and mix the ingredients well until the dough comes together and the flour separates from the bag. First: Place the bread dough, while still in the Ziploc, in a warm area and allow to rise for about 12 hours. If you have an oven with a bread proof setting you can also set the dough, while in the Ziploc, in the oven for about 7 hours or until the dough has doubled and you see many air pockets in the dough. The dough will appear damp and sticky, this is normal. Second: Dust aluminum foil with flour and dump dough from Ziploc bag out on it. Fold bread dough four-ways upon itself, place fold side down onto wax paper also dusted with flour and cover with a breathable cloth for another 2 hours, allowing dough to double in size again. Place Dutch Oven in kitchen oven at 450 degrees F for 15 minutes allowing the dutch oven to warm. Place dough inside the dutch oven and cover, baking for 35 minutes. Then carefully uncover the dutch oven and bake for another 10-15 minutes or until a dark golden brown crust is achieved. Place on cooling rack for 30-45 minutes before serving. Enjoy! … hope you have a great Tuesday!